Objectives: Arterial reconstruction in patients undergoing living-donor liver transplant is technically difficult because of the small diameter of the vessels in the partial liver graft. In this study, we present our technique for hepatic arterial reconstruction. Methods: Since December 2005, we have performed 54 living-donor liver transplants, which are analyzed retrospectively in this report. In our technique now used at our institution, native and graft hepatic arteries are spatulated from both the anterior and posterior walls to provide a wide anastomosis. Computed tomographic angiography is used to evaluate the vascular anatomy and to measure the diameter of the graft hepatic arteries. Results: Mean follow-up was 7.2 ± 5.5 months (range, 1-17 months). Nine of the 54 recipients died within 4 months of the surgery. At the time of this writing, the remaining 45 recipients (84%) are alive and demonstrating good graft function. In 2 recipients (3.7%) in this series, hepatic artery thromboses developed, which were treated with an interventional radiologic technique. Conclusions: Our arterial reconstruction technique has enabled reconstruction of smaller arteries and arteries of various diameters without an operating microscope. The rate of complications in our patients is similar to that reported in similar individuals. Because of the shortage of donor organs, living-donor liver transplant (LDLT) is gradually be-coming accepted worldwide as the best treatment for patients with end-stage liver disease. However, the arterial reconstruction required in LDLT is technically difficult because of the small diameter of the vessels in the partial liver graft [1-3]. Complications such as hepatic artery thrombosis (HAT) can result in graft loss associated with septic hepatic infarction and bile duct ischemia [4, 5]. 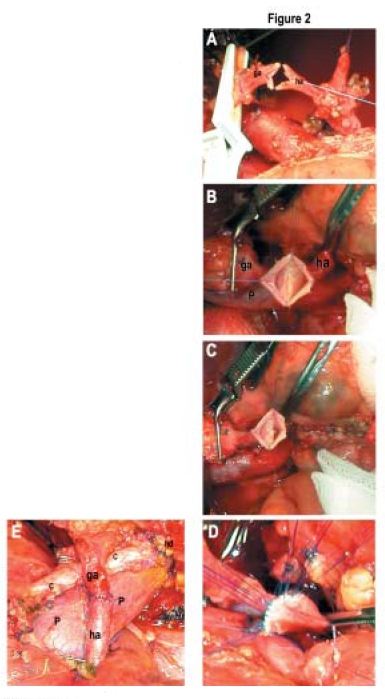 The use of microsurgical techniques has helped to overcome the high risk of an HAT in patients who undergo arterial reconstruction, and the effectiveness of that method has been cited in numerous series [3,6]. In this study, we present our hepatic arterial reconstruction technique, which does not require an operating microscope. Between September 2001 and March 2007, we performed 170 liver transplants at the Baskent University Hospital in Ankara, Turkey. Liver transplants in 133 recipients were performed with grafts from living donors and in 37 recipients were performed using grafts from deceased donors. In the first 104 recipients who underwent liver transplant, we used a modified parachute technique to create the arterial anastomoses . After December 2005, we modified this technique especially for recipients of LDLTs. Since that time, we performed 54 LDLTs (24 adults; mean age, 43.5 ± 12 years; age range, 21-61 years; and 30 children; mean age, 6.7 ± 5.7 years; age range, 6 months-15 years), which are analyzed retrospectively in this report. Fourteen of the children weighed less than 10 kg, and 13 were younger than 1 year. Twenty-five recipients received a right lobe graft, 13 received a left lobe graft, and the remaining 16 received a left lateral segment graft. The indications for LDLT were biliary atresia (n=9), viral hepatitis (n=15), Wilson’s disease (n=8), cryptogenic cirrhosis (n=5), fulminant hepatitis (n=3), and other causes (n=14). Most donors (57%) were a parent of the respective recipient. Computed tomographic angiography was used to evaluate the vascular anatomy . The diameters of the graft hepatic arteries were measured with computed tomography. To maintain graft viability, partial liver grafts were harvested without vascular inflow occlusion or graft manipulation. The length of the arteries was preserved as much as possible. Histidine-tryptophan-ketoglutarate solution was used to perfuse the liver. In all recipients, hepatic arterial reconstruction was accomplished using a surgical loop (2.5¥) performed by the same surgeon. An arterial anastomosis is usually performed with 7-0 monofilament suture placed between the recipient common hepatic artery, the gastroduodenal artery junction or the hepatic artery branches, and the hepatic artery of the graft. Sixteen graft arteries (29.6%) were 2 mm or less in diameter. The size discrepancy in the vessels was managed by gently dilating the thin vessel. After the vessels have been washed with papaverine HCL solution, 2 untied stay sutures were placed at both corners of the arterial ends (Figure 1A). 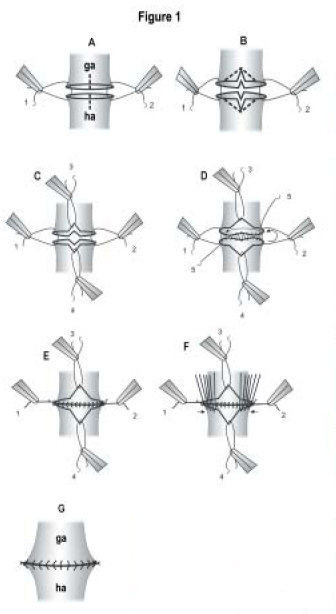 Native and graft hepatic arteries are spatulated approximately 1 to 2 mm from the anterior and posterior walls (Figure 1B), after which 2 retraction sutures are placed at the middle portion of the anterior wall of both recipient and graft arteries (Figure 1C, Figure 2A). A double-needle suture is then placed on the left corner of the posterior wall of both recipient and graft arteries. Then, 1 arm of that suture is continued to the right corner of the anastomosis (Figure 1D, Figure 2B). After the posterior wall of the anastomosis has been completed, both of the untied stay sutures on the left and right corners are tied with a running suture (Figure 1E, Figure 2C). The anterior wall of the anastomosis is sutured with interrupted sutures and completes the anastomosis (Figures 1F and 1G, Figures 2D and 2E). With regard to the patients in this report, 12 grafts had 2 hepatic arteries, and the adjacent edges of the 2 hepatic arteries were sutured together to create a single opening at the back table, after which the recipient’s hepatic artery was anastomosed to that orifice in 7 recipients, and 2 separate anastomoses were performed in the remaining 5 recipients. In the 7 recipients with 2 hepatic arteries, only the native hepatic arteries were spatulated from both the anterior and posterior walls. In recipients with a separate anastomosis, the right and left hepatic branches were spatulated. End-to-end anastomoses were performed in all recipients except 1. Intraoperative hepatic blood flow was assessed by Doppler ultrasonography (USG). In all recipients, the gastroduodenal artery was ligated to increase blood flow through the anastomoses. Doppler USG examination of the hepatic perfusion was performed twice daily during the first postoperative week. In addition, routine ultrasonographic examinations were scheduled 1 month after orthotopic liver transplant and at 3-month intervals thereafter. A heparin drip infusion was begun on the day of transplant and was adjusted to maintain active coagulation time levels between 150 and 200 seconds. The heparin infusion was continued for 1 week. After that, anticoagulation therapy consisting of aspirin (40 mg daily) and dipyridamole (4 mg/kg/d) was administered to all patients. Immunosuppression was accomplished with tacrolimus (0.1 mg/kg) administered via a nasogastric tube immediately after transplant. Tacrolimus trough blood levels were maintained at 10 to 15 ng/mL during the first month and then at 5 to 7 ng/mL subsequently. Methylprednisolone (10 mg/kg) was administered intraoperatively. It was continued postoperatively, and the dosage was tapered from 10 mg/kg to 0.1 mL/kg at the end of the first month until it was stopped at the end of the third month. None of the recipients received induction therapy. Mean follow-up for the recipients was 7.2 ± 5.5 months (range, 1-17 months). Nine of the 54 recipients died within 4 months after surgery. The causes of death were acute respiratory distress syndrome (n=2), brain death (n=1), pulmonary emboli (n=1), and sepsis with multiorgan failure (n=5). At the time of this writing, the remaining 45 recipients (84%) are alive with good graft function. An HAT was encountered in 2 recipients (3.7%) in this series. Two thromboses occurred in the first 10 transplants. The first recipient to demonstrate an HAT was a 6-month-old male infant (body weight, 7 kg) who had received a left lateral segment graft from his mother. The HAT was diagnosed on the fifth postoperative day by Doppler USG examination and was confirmed by the results of conventional angiography before enzyme elevation occurred. In this patient, the HAT was treated with percutaneous transluminal angioplasty and intraluminal stent placement; however, he died from sepsis and multiorgan failure 13 days after LDLT. The other recipient who demonstrated an HAT was a male infant 9 months old (body weight, 6.5 kg) who had received a left lateral segment graft from his mother. The HAT developed on the fifth postoperative day and was treated with percutaneous transluminal angioplasty and transcatheter arterial thrombolysis with recombinant plasminogen. This recipient had massive tarry stools and hematemesis, and he had a sudden hemorrhagic shock 60 days after LDLT. Angiographic studies revealed the rupture of a pseudoaneurysm at the intrahepatic arterial branch into the bile duct. It was treated immediately with successful placement of an intraluminal stent. At the time of this writing (12 months after LDLT), this patient is showing good graft function and a patent hepatic artery. Arterial reconstruction is a key to successful LDLT. Performing arterial reconstruction is more difficult in LDLT than in deceased-donor transplant because the balance between the benefit to the recipient and the safety of the donor must be considered. The incidence of hepatic arterial complications in patients who have undergone LDLT decreased to 3.8% or less after introducing microsurgical techniques for arterial reconstruction [1, 9]. The incidence of HAT is higher in pediatric LDLT recipients than it is in adult recipients [9, 10]. Lateral segment grafts and left lobe grafts are associated with a higher incidence of arterial complications. Since September 2001, we have used 2 different hepatic arterial reconstruction techniques for living- and deceased-donor liver transplants. The first of these methods (a modified parachute technique) was used in 104 recipients, in whom 4 hepatic arterial stenoses developed at the anastomotic site, and 3 HATs also occurred. Because of the high rate of hepatic arterial stenosis at the anastomotic site with the modified parachute technique, we changed our method of hepatic arterial reconstruction to make wide anastomoses. In the recipients in this study, the overall arterial complication rate was 3.7% (ie, 2 of 54 recipients experienced a complication that was an HAT). The 2 recipients with an HAT, who were among the first 10 recipients, were infants weighing less than 10 kg who had received a left lateral segment graft. Until recently, a liver graft with a narrow hepatic artery less than 2 mm in diameter was regarded as a contraindication for LDLT because of the high risk of an HAT [11,12]. In 2005, Alper and colleagues  reported their microvascular technique and outcomes in patients who underwent hepatic arterial reconstruction.. In that study, the diameters of the graft and recipient arteries were measured before arterial reconstruction by means of a sterilized paper ruler without manipulation. Those authors found that 76.12% of the graft arteries and 54.12% of the recipient arteries were 2 mm in diameter or smaller. At our center, hepatic arterial size is measured via computed tomographic angiography. In our series, 16 graft hepatic arteries (29.6%) were 2 mm in diameter or smaller. We believe that manipulation of a hepatic artery, regardless of the care with which it is performed during surgery, affects arterial diameter. Dual arteries encountered during a graft procedure can be addressed by any of 3 options, as previously mentioned. The first option is to divide the 2 arteries and reconstruct only 1. The second option is to divide the 2 arteries and reconstruct both. The third option is to perform a 2-in-1 segmental resection of the hepatic artery . Most transplant centers prefer the first option after backflow bleeding from the nonanastomosed branch has been controlled [11, 13]. In our series, 12 grafts had 2 hepatic arteries. In those grafts, the adjacent edges of the 2 hepatic arteries were sutured together to create a single opening at the back table, and in 7 recipients, the recipient’s hepatic artery was then anastomosed to that orifice. Two separate anastomoses were performed in the remaining 5 recipients. No hepatic arterial complications developed in these 12 recipients. The peak incidence of early HAT (ie, that which develops within 30 days after surgery) occurred during the first 2 weeks after transplant . We perform Doppler USG studies of the liver routinely every 12 hours during the first postoperative week and then as needed according to the clinical recovery of the patients. The use of Doppler USG was very important in the early diagnosis of HAT and successful graft salvage. Nishida and colleagues  have emphasized the importance of recognizing HAT revealed by serial ultrasonographic examinations. They reported significant decreases in the incidences of biliary complications and graft loss as a result of urgent revascularization after the early diagnosis of ultrasonographically revealed HAT. In our series, we diagnosed 2 cases of HAT 5 days after LDLT with USG, and we confirmed each diagnosis by conventional angiography before an increase in liver enzymes occurred. Both instances of HAT were treated with an interventional radiologic approach. In conclusion, our arterial reconstruction technique enables reconstruction, without an operating microscope, of smaller arteries and arteries of various diameters. The rate of complications in our patients is similar to that reported in similar individuals. Figure 1. Schematic views of the hepatic arterial reconstruction in our technique. A. Two untied stay sutures (number 1 and number 2) are placed at both corners of the arterial ends. B. Anterior and posterior walls are spatulated about 1-2 mm. C.	Two retraction sutures (number 3 and number 4) are placed at the middle portion of the both anterior wall of the arteries. D. A double-needle suture (number 5) is then placed at the left corner of the posterior wall of both recipient and graft arteries. Then, 1 arm of that suture is continued to the right corner of the anastomosis. E.	After finishing the posterior wall, both open loop stitch ends (number 5) are pulled to the left and right corners to lessen the excess and the posterior walls of both arteries are approximated tightly. Next, both untied sutures on the left and right corners (number 1 and number 2) are tied. F. The anterior wall of the anastomosis is sutured with interrupted sutures. G.	End of the anastomosis. Figure 2. A. Two untied stay sutures are placed at both corners of the arterial ends, anterior and posterior walls are spatulated about 1-2 mm, and 2 retraction sutures are placed at the middle portion of the both anterior walls of the arteries. B. A double-needle suture is then placed at the left corner of the posterior wall of both recipient and graft arteries. Then, 1 arm of that suture is continued to the right corner of the anastomosis. C. After finishing the posterior wall, both open loop stitch ends are pulled to the left and right corners to lessen the excess, and the posterior walls of both arteries are approximated tightly. Next, both untied sutures on the left and right corners are tied. D. The anterior wall of the anastomosis is sutured with interrupted sutures. E. End of the anastomosis.